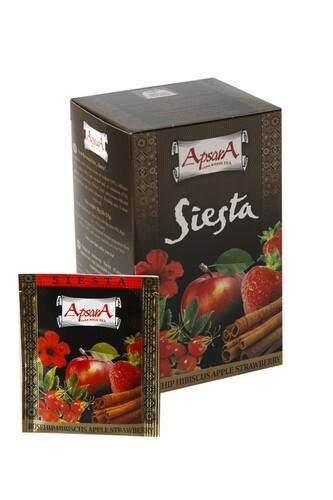 Fruit flavoured tea „ Siesta”. Ingredients: finely broken pieces of rosehips, apples, hibiscus and shreded peel of cinnamon, raspberry and strawberry flavour. Taste: juicy-sweet with rich berry aftertaste and gentle cinnamon finishing note. Brewing instructions: Boil fresh water. Use 1 teabag per 200ml of water. Recommended infusion time is 5-8 minutes. Features&recomendation with food: Thirst quenching and cooling summertime beverage. Ice cream, coctails and fruits. Product highligths: Red wine and Siesta might be desirable option across of Mediterranean. We wish to bring this filling of lazy afternoon with our fruit tea! Teas are packed with highly sofisticated device, providing evey tea bag with a knoted string and tag. Envelopes are sealed for freshness and protection of tea.